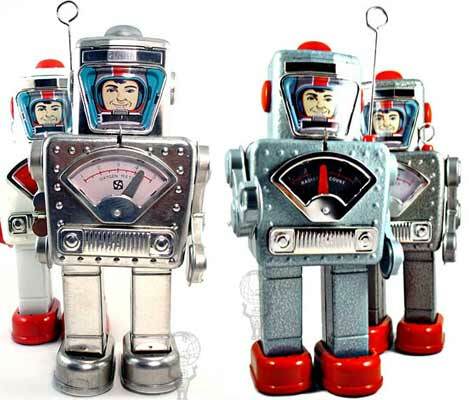 Planet Robot manufactures beautiful limited edition reproductions of the 1950s Yonezawa Space Explorer tin robot. Each series is restricted to a production run of 200 units or less (it looks like the total production run was 1000 pieces). The robots are machine stamped and hand assembled - I was quite surprised to see photos of workers bending tin with pliers, although it helps to explain why less labor-intensive plastic toys are the norm these days. Prices range from $93 to $103. These were manufactured in October 2005, so very limited quantities of some variations are still available. Treat this as a once in a lifetime opportunity to create your own clockwork army. 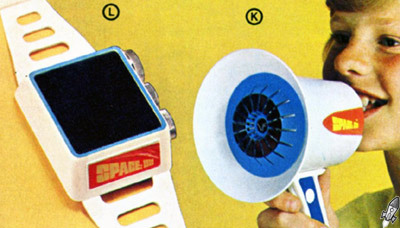 It's hard to believe gadgets like radio watches were once virtually impossible experiments in miniaturization. It's also astounding that companies once sank vast fortunes into the development of such questionably useful gizmos. 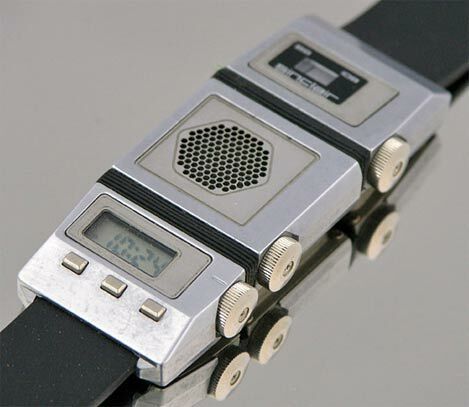 Sinclair Research - creators of the ZX Spectrum and Timex/Sinclair computers - unveiled a futuristic prototype FM watch in 1984. The three separate cases hold an LCD watch, piezoelectric speaker and FM tuner, along with a separate battery compartment in the clasp. The watch design was spearheaded by Sinclair product design manager Dagfinn Aksnes, who recalls that Clive Sinclair's casual design brief was, "Design an FM Radio Watch as small as possible. The watch must have an integrated speaker and aerial. The aim is to design the first/smallest integrated FM Radio Watch in the world." 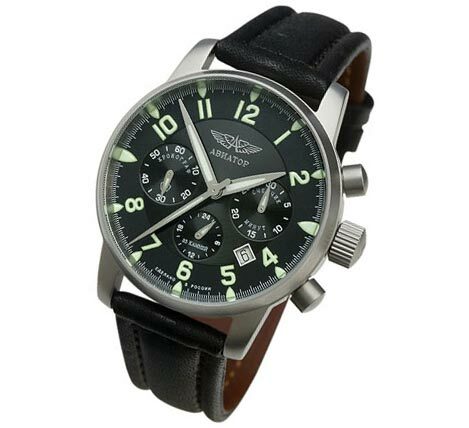 Sinclair's partner TIMEX was selected to manufacture the revolutionary watch. Unfortunately, Sinclair's precarious financial situation in the mid 1980s caused the project to be canceled after the production of a mere 11,000 units (the tooling was built to handle an annual production capacity of 500,000 watches) and only a few remain today. There's not a great deal to say about this store display. What you're seeing is a genuine product - this firm created a full line of colorful plasticware decades ago. My only real question is as to whom framed it. 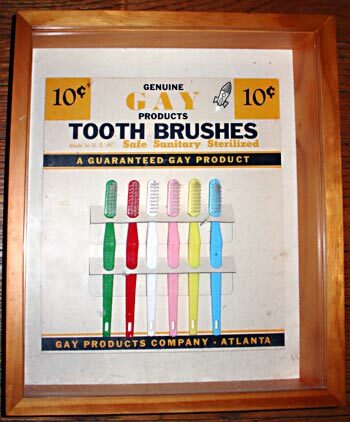 Do you think that this was framed back in the 50's as a product sample, or might it be a snickering look at how much a single word can change over the years? English Russia has posted a couple of grainy camera phone shots of what is apparently a modernized version of the vintage LADA 2107. The boxy original was withdrawn from the western European market in the late 1990s after over 25 years of production, although I vividly recall seeing one offered as a prize on a TV game show in the former Soviet Union during the summer of 2003. At any rate, the new "2107M" definitely appears to have been sired by the very same Fiat 124 that provided the inspiration for the original line. The headlights and taillights have been restyled to resemble a modern Italian washing machine, and the trim and mirrors are now a svelte shade of black plastic. All in all, it's a remarkable impersonation of a 1980s Czech Skoda. If this turns out to be the real thing, Autovaz might be trying to make a few sales from well-heeled patriots who remember the "good old days" when Russian streets were filled with "proper" cars, rather than the motley collection of second-hand Japanese and German vehicles that predominate these days. Sadly, I suspect the average middle class Russian now aspires to a sleek Toyota or Renault instead. The original chrome-grilled 2107 is still featured on the Autovaz site. Strange things abound in Russia, so it should come as no surprise that Poljot - known in Soviet times as the First Moscow Watch Factory - now offers Swiss movements in some of their higher-end timepieces. It seems to defeat the purpose of owning a "genuine" Russian watch if the guts are precision manufactured by Swiss elves in their cozy alpine caves. Still, one has to admit that Swiss mechanisms have a reputation for accuracy and quality, while their Russian counterparts tend to be considerably more, uh, rustic. But who really needs a reliable timepiece these days, when nearly everyone has a mobile phone tucked into their pocket? Poljot Aviator Chronographs are available with Russian 25 jewel mechanical lever movements for $477, but they're only accurate to within -20/+40 seconds per day with a 42 hour power reserve. If you've got a slightly larger credit card limit, you can substitute a beautiful Swiss ETA 7750 automatic movement (as used in the Omega Seamaster and IWC Fliegerchronograph) starting at $1177. Or you could just drop by Wal-Mart to pick up a $10 Casio digital. The Bolex H-16 is one of the most popular 16mm cameras in the history of film. First introduced in the late 1930s, tens of thousands of these workhorse Swiss spring-drive cameras have been manufactured. If you're shying away from getting your hands on one because of the high price of 16mm film, consider purchasing a Double Super 8 (DS8) Bolex instead. We briefly mentioned DS8 a few weeks ago; it's a hybrid format that uses 16mm wide film to capture Super 8 sized frames. One half of the film is exposed, the reels are flipped, and the other half is shot. The 16mm strip is cut into two 8mm reels after processing and can be projected or transferred as "normal" Super 8 film. 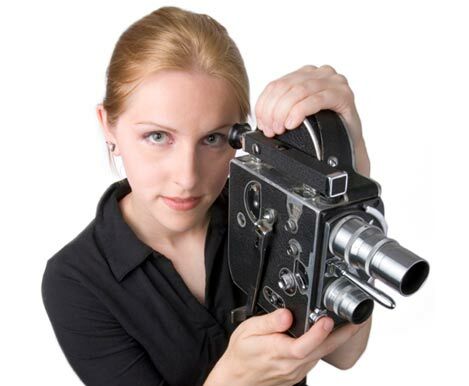 JK Camera modifies Bolex H-8 Standard 8mm cameras to accept DS8 film. A Bolex H8 Rex-3 camera body converted to Double Super 8 costs $445 with 10x TTL viewfinder. The sprocket holes are aligned with the center of the frame and enlarged film claws are installed. The reel spindles also have square adapters to accept 16mm film reels. The mod offers several key advantages: Super 8 has a significantly larger image area than the older Standard 8 format, a DS8 camera will provide more stable image registration (the frame won't jump and weave as much) and you'll get 4X longer running times than 16mm. The ColecoVision was a successful and quite capable video game console introduced in 1982. Much of its initial popularity was due to an excellent pack-in version of Nintendo's Donkey Kong. The subsequent Coleco Adam was an attempt to capitalize on this success by adding a full-fledged computer system to the main unit. You could buy it in two configurations: A standalone system, or as an add-on for your ColecoVision unit. The unit included a "typewriter quality" daisywheel printer and external keyboard, with a serviceable word processing package in ROM. It also included a (somewhat unreliable) proprietary high-speed tape drive for program storage. For some peculiar reason, the power supply was in the printer case – the machine wouldn’t turn on without the printer attached. The system was priced at a hefty $595. 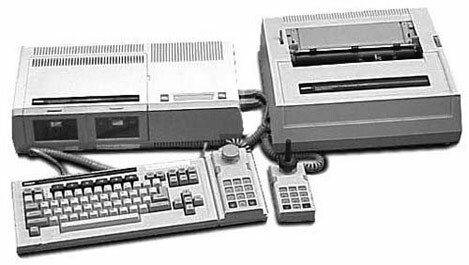 It included 80K memory, a respectable 3.58 MHz Zilog Z-80A microprocessor and three Motorola 8501 "support processors" for memory/tape/keyboard scanning, and full compatibility with ColecoVision game titles. Unfortunately, the system just wasn’t ready for prime time – a significant number of Adams were returned to the factory (as many as 50% of the tapes were returned because of defects), and Coleco lost millions. Without the Adam, Coleco might have been able to weather the video game meltdown in the mid-1980s -- especially if they had continued to license top-notch game titles from Nintendo. Sadly, the ColecoVision game console itself was discontinued in early 1984 after selling more than 6 million units (versus a piddly hundred thousand or so Adam PCs). That left the market wide open for Nintendo. 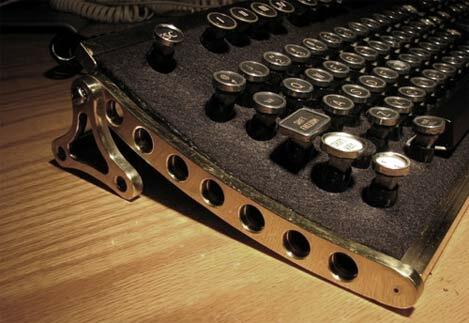 Ahh, steampunk. Check out this fantabulous IBM Model M keyboard mod. It's enough to make you realize just how icky and plasticy most modern high tech gear actually is. Of course, vintage IBM keyboards were decidedly different, even without modding. Mine weighed a ton and offered amazingly loud and tactile key action. I dimly recall that it was made in Ireland, which always struck me as slightly odd. Yes, there's a new lo-fi sound chip on the market. But more about that in a moment. Pop music evolved at an unbelievable pace in the early 1980s, thanks to the arrival of affordable personal computers, digital sampling and low cost polyphonic synthesizers. 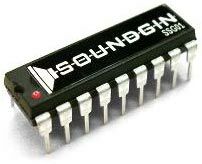 It didn't take starving musicians long to figure out that their computers were quite capable instruments all by themselves, and the chipmusic scene evolved to explore the distinctive capabilities of computer audio chips such as the three-voice SID chip (Commodore 64) and the Yamaha YM2149 (Atari ST). The quirky analog charm of these early chips gradually gave way to digitally sampled sound (the Paula sound chip in the Amiga is one brilliant early example). Things weren't quite as rosy in the PC world, which was dominated by the harsh metallic plinks and ploinks of FM synthesis thanks to millions of Creative Labs Sound Blaster cards. The magic had been lost. Nevertheless, the classic 1980s chiptune sound survived and flourished and the recent arrival of the Prophet 64 Commodore-based music system was an unexpected boost. But even the slick Prophet 64 environment relies on a vintage Commodore 64's sound generation circuitry. The chipmusic world desperately needed a new sound chip -- and it has finally arrived. 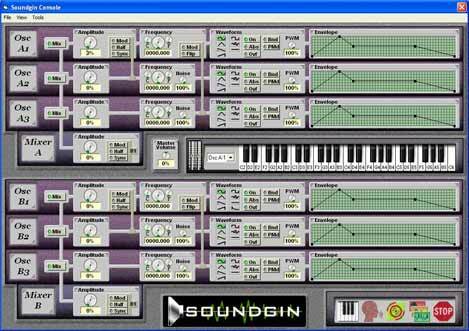 The Soundgin is a 6-voice "synth on a chip" designed by Scott Savage. It's based upon a custom-programmed Microchip PIC microcontroller to keep costs low. Unlike the digitally controlled analog circuitry of early 1980s designs, the Soundgin is completely digital. That means you'll have to do without the charm of analog filters, but the Soundgin offers an impressive array of tricks including frequency modulation, ring modulation, hard oscillator sync and even the ability to synthesize English speech sounds. Of course, you'll require some programming and DIY hardware skills to make one of these little wonders run. It features a convenient 2400 or 9600 bps serial interface and comprehensive Windows software is available for programming. The price? A very reasonable $24.99, available from several online retailers. 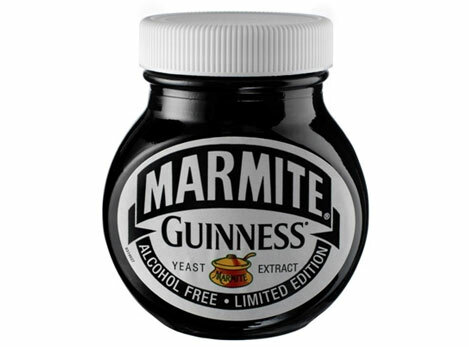 I admit an almost unhealthy love of both Guinness beer and Marmite yeast spread. I know it's probably the result of a horrible genetic mutation, but humour me anyway. The drunkards at Guinness have teamed up with the industrial food elves at Unilever to brew up a memorable batch of limited edition Guinness Marmite, featuring 30% Guinness yeast extract. The result is apparently less salty than Marmite and less hangovery than gallons of grog. Only 300,000 limited edition jars will be foisted on an unsuspecting British public sold at around £2.49 each. Alas, it's alcohol free. I look forward to the eventual release of Heinz Baked Bean Marmite with giddy anticipation. "While looking around my neighborhood this morning, I realized there were no TV antennas poking out from the rooftops. I suppose this is another sign that the Television Age is well and truly dead. Thirty years ago we were limited to a small handful of off-the-air programs. If a good movie or show was on, half of the neighborhood was watching. Now viewers are faced with the daunting task of choosing from hundreds of boutique channels. And -- worst of all -- we have to pay a significant monthly fee for the privilege of watching commercial-splattered shows." 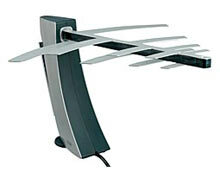 The arrival of digital HDTV broadcasting has breathed new life into the lowly television antenna. Viewers in major metropolitan areas are quickly discovering that digital OTA channels offer significantly better quality than their heavily compressed cable or satellite counterparts. This is one of those very rare cases where free = better. I suspect many viewers will eventually abandon their monthly services in favor of a handful of high quality local OTA channels and the convenience of purchasing their favorite cable-only shows for online providers such as iTunes. 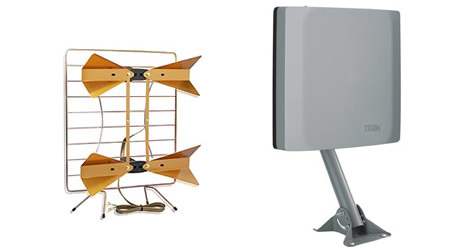 Radio Shack - always a bellwether of cheap and cheery electronic trends - now offers a half dozen HDTV antennas starting at a downright affordable $14.99. Designers also seem to have realized that most people expect sleek and modern designs, rather than rabbit ears that look like they escaped from the top of a 1970s Zenith console TV. Alas, the American changeover to digital TV broadcasts won't be complete until 2009, so you might be outta luck for a year or two. Gerry Anderson is a famous TV producer who created legendary marionette TV shows in the 50's and 60's. These shows were seen around the world, and are still memorable thanks to the sophistication of the marionettes, the dazzling effects, and a bevy of marvelous vehicles. Anderson tried his hand at live-action sci-fi aimed at adults, the most notorious of these being Space:1999. Never letting the science get in the way of the fiction, the much derided Space:1999 has often been blamed for the death of television sci-fi until the mid 80's. Some of the confusion over the show's intended audience stems from Anderson's reputation as a children's TV producer, and like with any other Anderson production there was a raft of kid's merchandise. Above you can see both a wrist AM radio and a loudspeaker, neither of which appeared in the series of course. 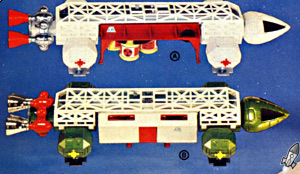 Below are two definite stars of the show; the magnificent Eagle spaceships. The Eagles were made by Dinky Toys, a company with a great reputation for creating great toys. I remember seeing and playing with these as a boy at Marshall Field's in downtown Chicago (a surprise to have such expensive toys within arm's reach of children), and they were terribly fun. Lots of moving parts, detachable modules - even a magnet on a winch for picking up barrels of nuclear waste. Here's a lesser known game from the darker harbors of Parker Brothers. The metallic playing surface looks like water, and players push around freight using little metal tug boats. If you're not careful, your tug will touch one of the metal buoys and set off a rather loud alarm bell. You have to operate your tug fleet under a time limit, so check out this innovative timer... 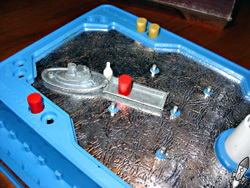 Instead of including a little hourglass or a spring-wound timer, there is a slanted channel that runs along the outside of the game board. The included steel ball clacks (and it's a bit nerve wracking when you're just trying to deliver freight to the other side of the game board) against the bumpers inside the channel, and it works out to be a darned good timer. Why haven't other games used this timer system? This game was developed by the Chicago design firm; Marvin Glasser & Associates. They developed a lot of games and toys including Rock 'em Sock 'em Robots, and a game that uses similar "technology" Operation. The company still designs toys under the name Big Monster Toys today. In January, you can always rely on your insurance guy to give you a calendar. Berwyn Trains & Hobbies has promo flyswatters, the deli used to give out dustpans, and the hardware store always has keychains. So these cheapie giveaways can almost become a tradition. 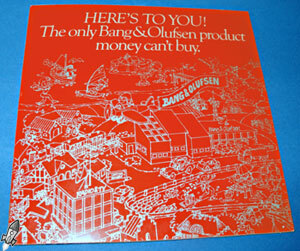 Bang & Olufsen is a manufacturer of stylish hi-fi equipment, and they have a similar promotional giveaway tradition. B&O sells a lot of high end audio visual gear with a high sense of design. Audiophiles have long disputed the balance of form versus function in B&O gear, but it would be hard to argue the utility of this classy giveaway that dates back to 1937. Open this cardboard folder to reveal the Bang & Olufsen bottle opener. 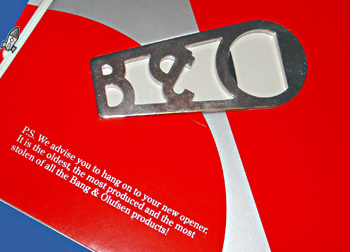 Based on B&O's stylized logo (though the opener is upside down in the sleeve - sorry! ), this little chrome beauty has the heft you need to contend with any number of bottles. The text inside reads: "We advise you to hang onto your new opener. It is the oldest, the most produced and the most stolen of all the bang & Olufsen products". With the elitist attitude accorded B&O, you'd think that they'd give out a corkscrew, or a special tool for plucking pheasants. Nice of them to give away a "regular guy" thing like a bottle opener. I think that I'll use it to crack open a Pilsner next time I'm spinning records on a B&O turntable. This may be the item that fits the most Retro Thing categories ever! Clearly this is a book, it deals with optics, and it uses a turntable to make the magic work. 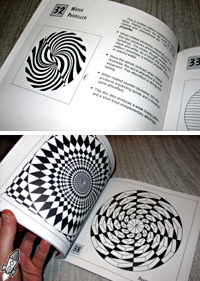 The first section of the book details how many popular spinning optical illusions work, the second part having full-page optical illusions that can tear out. The book has a hole through its center, so once you tear out the full page illusions you can pop them on your turntable. The book explains that while you can see many of these illusions by spinning the patterns on a pencil tip, they work better with constant rotation like that provided by a turntable. The part that might be the most surprising is the publishing date of the book: 1992. That's quite a bit after turntables were on their way out of many households. The book's intro makes mention of this, joking that this book will help you get some use out of that "obsolete turntable" you didn't throw out yet. 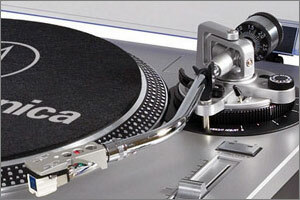 I won't agree that record players are useless - to the contrary, this book is just one more use for your platter spinner! To think that it used to just be the music I chose to put on the turntable that made me dizzy! 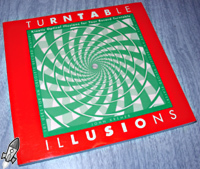 Click HERE to pick up "Turntable Illusions" and help out Retro Thing.